BIGG success is life on your own terms. There are five elements of BIGG success: money, time, growth, work and play. Money and time are our two resources. Most people are familiar with the compounding power of money. For example: Assume you invest $100 a month in a plan that allows you to defer the taxes when you’re 35 years old. 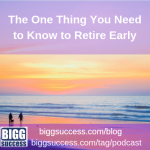 You plan to retire at 65 (30 years from now). If you earn a 6% return (conservative by historical standards), your retirement portfolio will be almost $102,000. Not bad on a total investment over the years of $36,000. A small amount of money, invested wisely over time, turns into a BIGG sum. What about time? Does it compound? You may not have money to invest. But everyone has the same amount of time every day. Time is the great equalizer. Time, our other resource, compounds similarly to money. If you invest time, over time, you can create BIGG success. It may come in the form of money or in some other form (e.g. a better life for you and your family). If you invest your money in the wrong thing, you may lose all or part of it. Or you may not earn as much on it as you should. The exact same principle applies to time. If you invest your time poorly, you won’t reach your full potential. You’ll miss opportunities. You must focus to reach BIGG success! You obtained a really useful weblog I have been here reading for about an hour. I am a newbie and your achievement is really a lot an inspiration for me. So glad to hear it … thanks for letting us know! “The Power of Compounding” time. That’s a clever title that brings that point home. Dan, we love that quote from Seth Godin! Thanks so much for adding to our post. Really Bad Days Spark Innovation Have You Experienced Shrinkage at Work?